The Hoonigans simply can’t seem to do any wrong. These are a group of guys that simply love cars, making loud noises, and doing dumb things with motors. This project, definitely one of the more mild builds in the Hoonigan Donut Garage, is simply the good truck. Modern trucks are huge and can’t hold a candle to the style of a simple C10. To give the truck the drivability and modern throttle response desired, the truck’s stock small-block V8 was given an aftermarket EFI kit. After that, it was just a matter of getting the stance right and putting the right wheels on the truck. 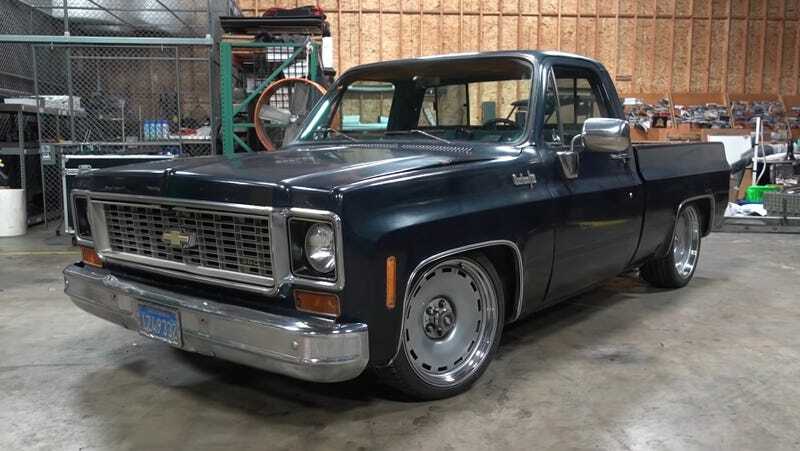 The joy of an old truck like this, of which kajillions were sold, is that the proper stance comes in a simple bolt-on lowering kit from Belltech. It’s always been my opinion that the right wheels make the vehicle look right. The choice here of a set of 20s from Detroit Speed wouldn’t have been my first to make, but they look damn good when bolted up. I’m not usually a fan of big wheels, but the truck has such large wheel openings, and the wheels still manage to be visually understated, so it works pretty well here. If you can cut, drill, and weld a small amount, this whole kit can work on your truck, and you can install it yourself. It’s relatively simple to make a standard issue vintage work truck look like this. Looks like I’m going to spend the rest of the day on Craigslist looking for an old C10. This thing is going to look absolutely proper hauling Zac’s chopper Harley around Los Angeles.